Confession – I love craft fairs. I remember a few decades ago going to a huge Christmas craft fair in Calgary. It was amazing. I did all my Christmas shopping there that year, and must confess I hold craft fairs up to this high standard. Having said that, there are two craft fairs coming up that have caught my eye. This event is being hosted October 20th from 5-8pm by the Maui Historical Society at the Bailey House Museum in Wailuku. Okay, it will be small – the advertising itself says ‘intimate’. But, the setting for this craft fair in itself is neat. And… they will have live music by Uncle George Kahumoku. One of my favorite local photographers will be selling her amazing cards there. 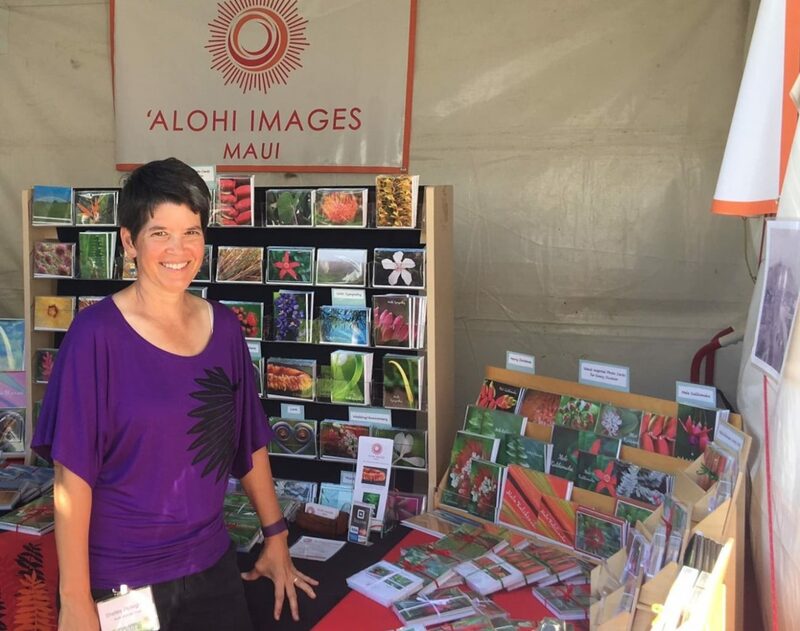 Do check out Shelley’s cards at Alohi Images – she just announced she has new designs coming soon, just in time for Christmas card season! Admission is $5. All products offered for sale must be made, manufactured, grown and/or created in Maui County. Although products may include source materials made/found in the State of Hawaii. Absolutely no ‘made in a third world country and sold as a local product’. Admission is $5. Be there! What a perfect place to buy your Maui souvenir – or start your Christmas shopping! I’ve noticed a sign on my way to the Kalama Park hockey rink lately. Truth is, it may have been there for years, I’m not sure. But I have noticed it lately. It says Blue Door Bakery. Having grown up in Austria the word ‘bakery’ is quick to catch my eye. I love most baked goods and especially a good loaf of bread. After a few weeks of seeing the sign, I stopped in one afternoon – but sadly the bakery was closed. 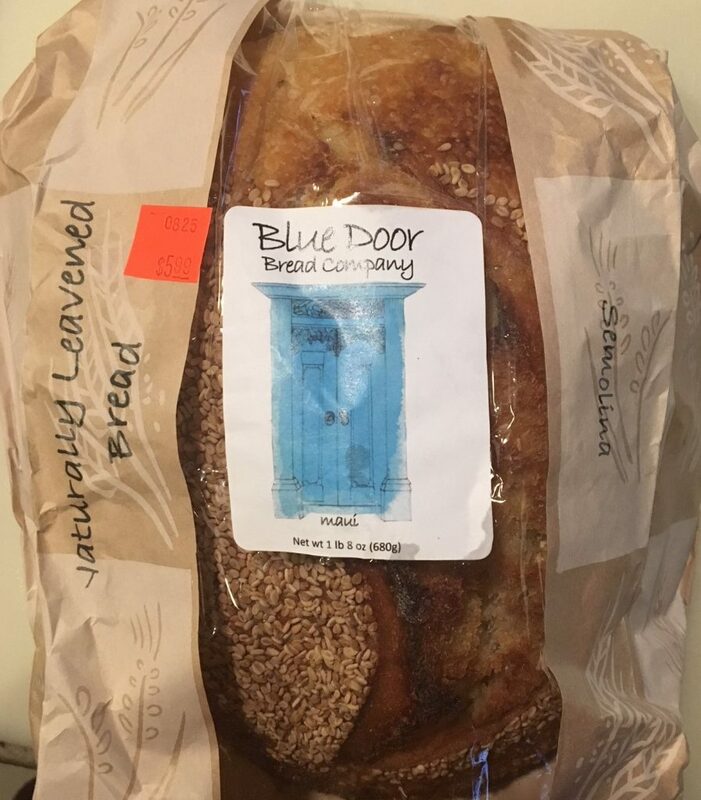 So I went online and saw that the Blue Door Bakery is open Monday-Fridays 8am to 2pm (or until they sell out). 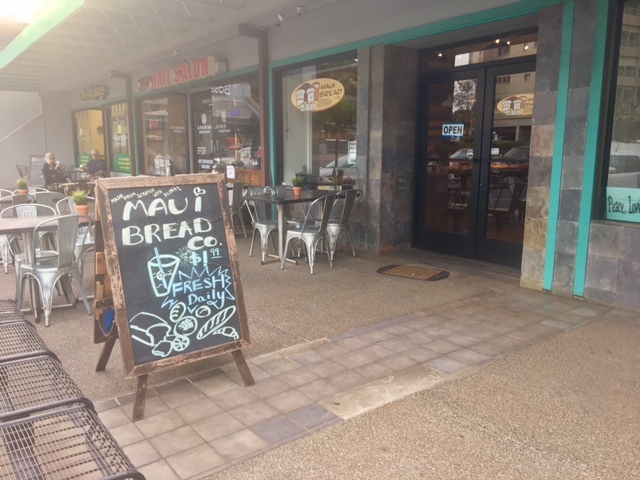 I haven’t been able to make it there during those times, so I did the next best thing – I went to Hawaiian Moons, the Kihei organic food store, one of several local stores that sells Blue Door Bakery bread. 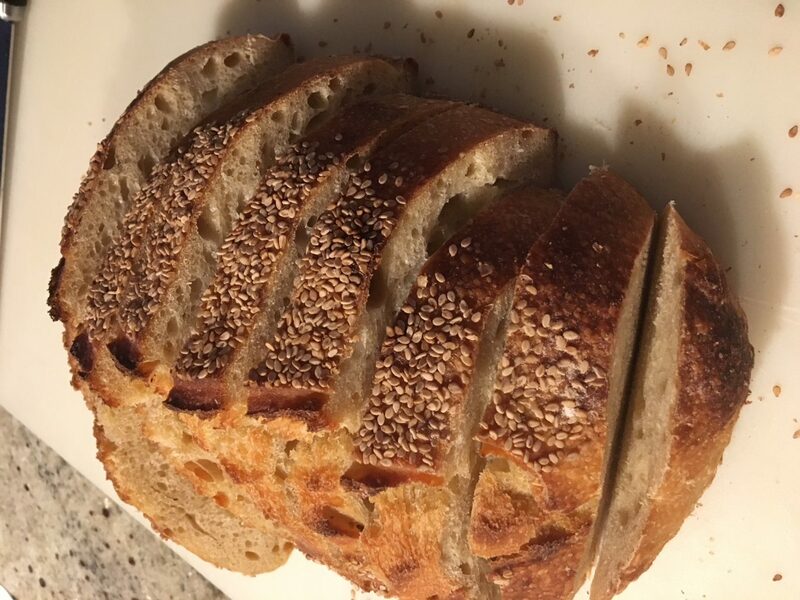 I picked up a loaf of sesame semolina – all they had left by the time I got there. It was delicious! According to their website this bread is all natural organic and uses old-fashioned natural-rise methods (instead of yeast). The semolina tasted like sourdough bread to me. I don’t know if sourdough is the correct term, but …. hey, I love EATING bread, I don’t know much about baking bread. Today I needed more – so back to Hawaiian Moons I headed for another loaf. This time I picked up a loaf of Levain. This one doesn’t have the sourdough taste. Absolutely delicious. If you like bread and like me do not care for toast bread, give this local bakery a try. Hawaiian Moons is a small organic grocery store on South Kihei Road across from Kamaole 1 beach (near Cafe o Lei). If you are staying at one of our condos, be sure to take the Pueo Premier Card which should be on the counter near the keys or by any restaurant menus. It gives you a 10% discount off anything in the store. Besides introducing you to organic/natural food loving locals and visitors, the store also has a good section of healthy (natural) take out foods. Please do RETURN the Pueo discount card to the condo so the next guest can use it. If you aren’t staying at one of our condos, stop in at the Kamalii Elementary School office – they sell these Pueo Premier Card for $10 cash as a school fundraiser. Help the local elementary school out and get loads of restaurant and store discounts around the island. This morning Sig and I went for a walk along Kamaole 1 beach. I love to kick off my shoes and walk on the packed sand, letting the ocean touch my feet as the waves come in. Sig not so much. However, he humored me as we went to investigate Dale Zarrella’s latest carving. 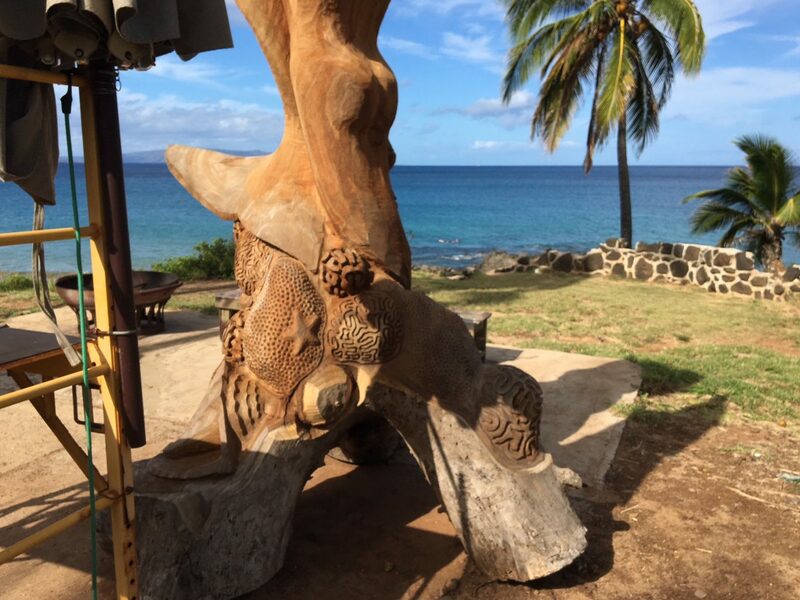 We walked North towards Charlie Young where Maui sculptor Dale Zarella has his ocean-front work station on a rock outcropping. The scenery has changed a bit. Last time I walked by there, he took me and a friend to see his gallery tucked in behind his older-style bungalow. Today a tall construction fence blocks off the area where at least one condo building is under construction. Unsure what’s being built on his lot. Maybe he sold it – maybe he is building a new house. If so – good for him! He is still working there, though. This morning there were two blocks of wood – the first tarped off. It was hard to get a decent picture of the second with his platform in the way, I shouldn’t complain but just be thankful that he allows others to come look. Do you see the embrace? The figure on the left, a mermaid, on the right a human perhaps? I can’t wait to see the detail he will put into this statue. Other statues I’ve seen of his are amazing. Check them out on his website. Where to find this? Park at Kamaole 1 beach (or across the road on the large open lot) and walk right along the beach to the very end. As you walk towards the rocky out cropping you should see a large block of wood or two perched up high. If he’s not working, he has them tarped off. If they are uncovered, he must be somewhere nearby. Enjoy – but please be respectful. Hawaii used to be known for its pineapple plantations. These days they are now mostly gone – replaced by cheaper imports from other places. However, there are still fields to be found on Maui and it seems more fields have been planted recently. 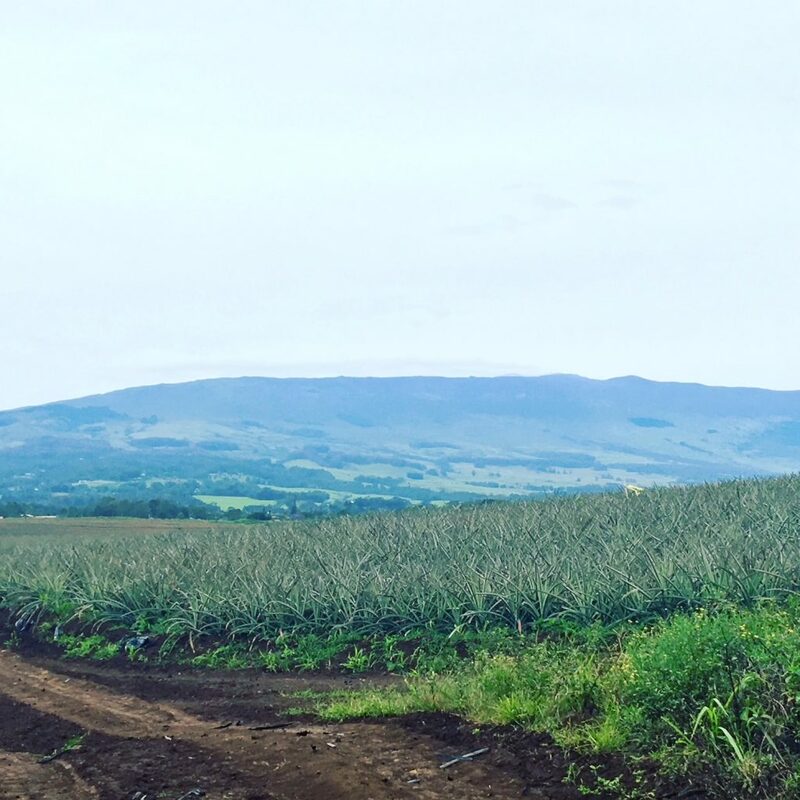 Drive upcountry to Hailemaile and if you look carefully, you will see some pineapple fields. Plants are close together, creating a dense pineapple plant field. Note, please do not trespass on these fields, even if just to take pictures. 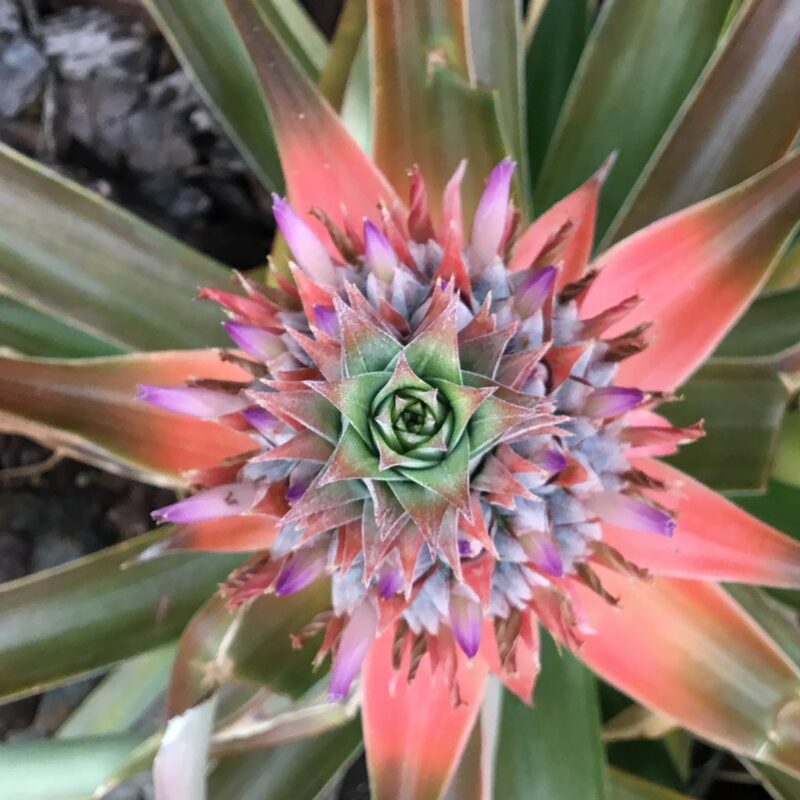 From my experience growing pineapples from pineapple tops in my flower bed, it takes roughly 1 1/2 years to grow one fruit per plant – if you’re lucky. My favorite growing stage is when they bloom. Each of those little notches on the hard skin represents where a tiny purple flower bloomed. Soooo beautiful. Costco stopped selling Maui Gold Pineapples this past year – replaced by fruit that is supposedly grown on Oahu (though I’m suspicious). However, there are a few local businesses that still grow and use Maui pineapples. 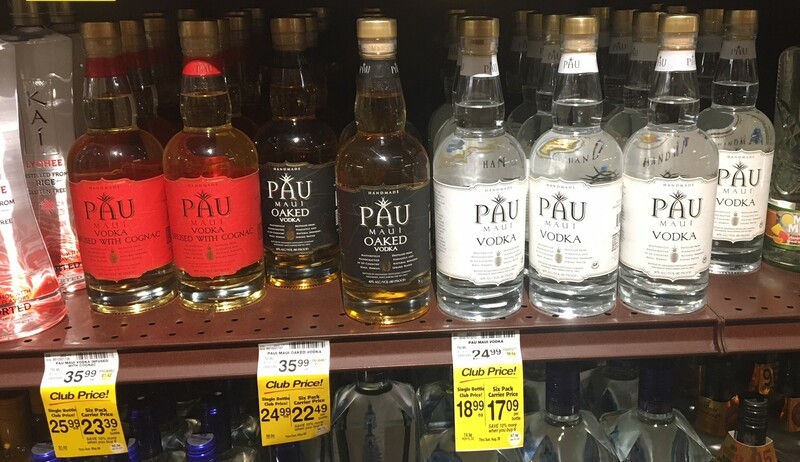 The Hailemaile Distilling Company produces Pau Vodka. Check them out in Hailemaile, go for a tour and see their tasting room. They also offer tours of their fields. 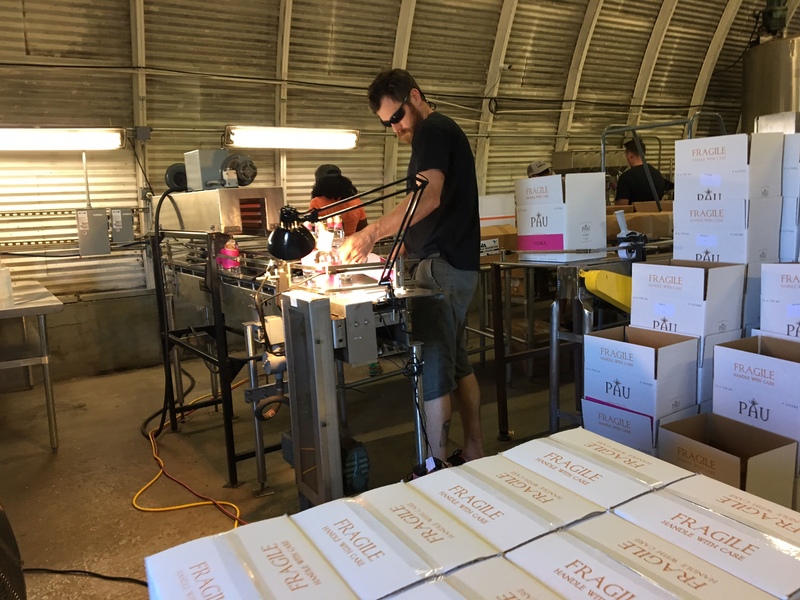 The Maui Winery also uses local pineapple for their three pineapple wines ~ Splash, Maui Blanc and Hula. These are available at your Maui grocery stores or for sampling at the Maui Winery at the Ulupalakua Ranch. 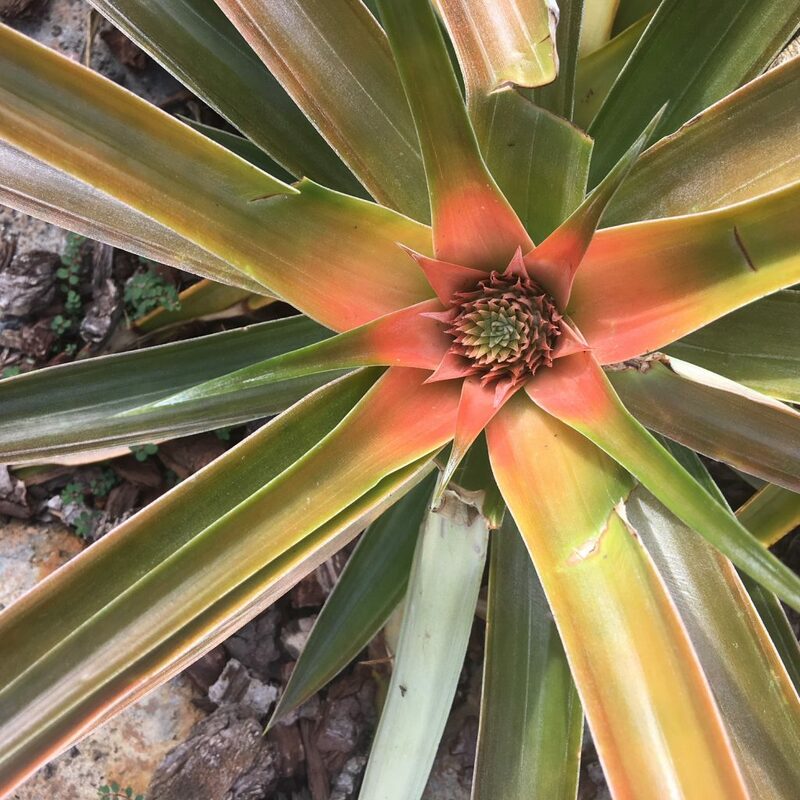 If on Maui, look to buy a Maui Gold pineapple. Farmer’s markets should still have them available, even if Costco does not. They are unbelievably sweet and juicy. Maui Open Studios – explore Maui! It’s February and that means it’s time for the free self-guided tour of some of Maui’s artists’ studios. This annual event is called Maui Open Studios. If you enjoy exploring and art – check this out. I promise you, you will find places on Maui you have never been before and meet some interesting people along the way. Grab a copy of the print guide or browse the online PDF edition. Then each weekend check out some new favorite artists, watch them in action, talk to them about their art and maybe buy a very unique souvenir of your Maui trip! Did I mention the event is free? One of my personal favorites, Beth Cooper, is participating in the 3rd weekend event here in Kihei. Over the years I’ve bought a few of her paintings for our condos and many of our cards (prints of our paintings). 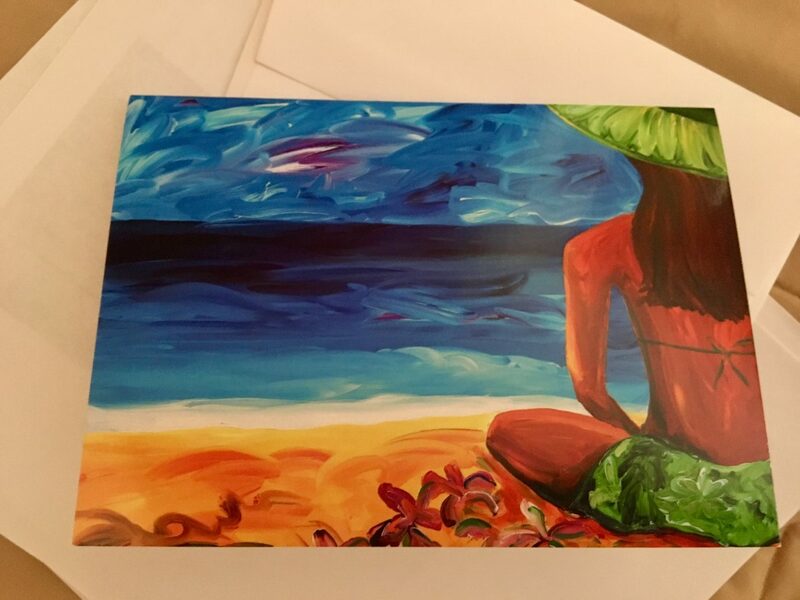 You can also find Beth’s paintings in our Sugar Beach condo (her Tahiti scene in our living room) and at our Palms at Wailea condo (a small beach scene in the hallway). Here is another picture of one of Beth’s cards. one of Beth’s cards I’ve bought – when were you at the beach last? What is your favorite Maui coffee? 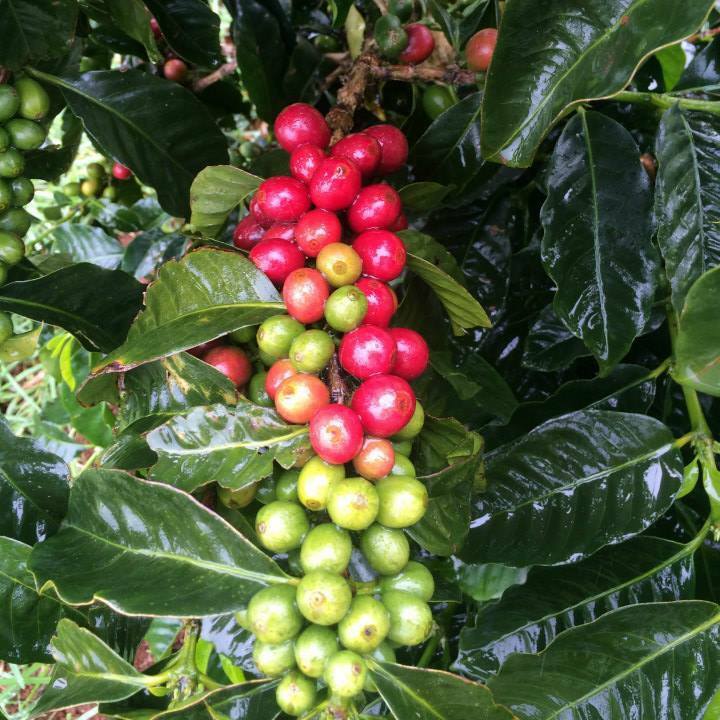 Have you sampled your way through Maui coffees? We have a number of coffee growers and roasters here on Maui, and I suggest that when here you give them a try. After all, Starbucks will still be there when you get back home. But in the mean time, you may discover a new favorite coffee, and you’ll have fun searching for it while on vacation! Yesterday was the 9th annual Statewide Cupping Competition. I have never made it to one of these, though I think – as a coffee lover, that would be really cool to go see. This year’s took place at the Maui Tropical Plantation here on Maui. This year’s winner in the creative category is a local coffee grower/roaster in Olinda – Olinda Organic Farm. I just checked out their website, looks like they may only sell at certain Farmer’s Markets, but do contact them and see what they say. I’ve written about coffees in the past, if you type coffee in the search bar on my blog, you’ll come across a number of them. I love Maui Oma’s coffee, if for no other reason than the name (Oma means Grandma in German). Grandma’s Coffee House up in Keokea on the way to the Ulupalakua Ranch has some great home grown/roasted coffee (with delicious deserts to go with it). Kula Botanical Gardens is a new one I discovered this spring – though it was quite a dark roast (I prefer medium). Costco carries some nice local roasts, though likely not as fresh as the ones you’d get directly from the roaster – my current favorite at Costco is by Kauai Coffee Company. My husband Sig was at their farm on Kauai this past May and brought home a bag of their freshly roasted beans (so delicious). Interestingly this past spring Costco in Western Canada was carrying this coffee also. I discovered this when visiting my cousins in Edmonton! 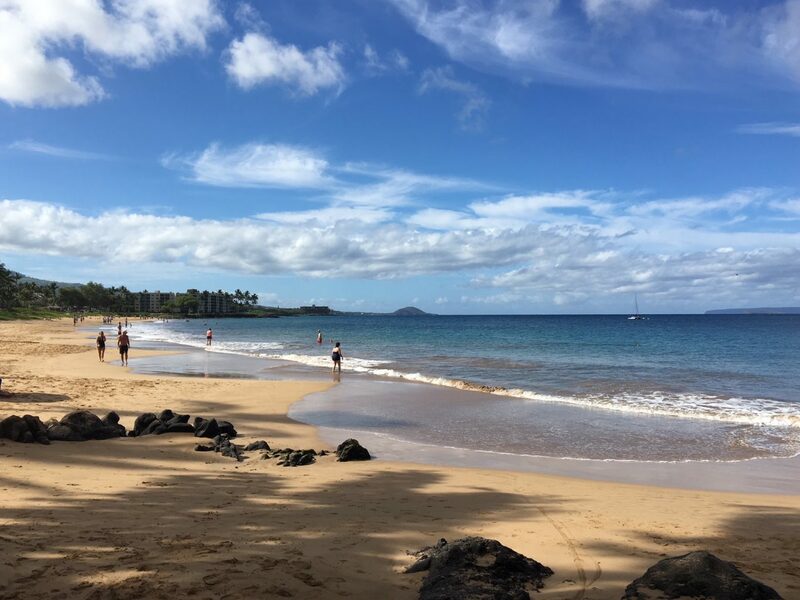 I’m curious – which is your favorite Maui coffee? Where did you buy it? I’m always interested in trying something new! 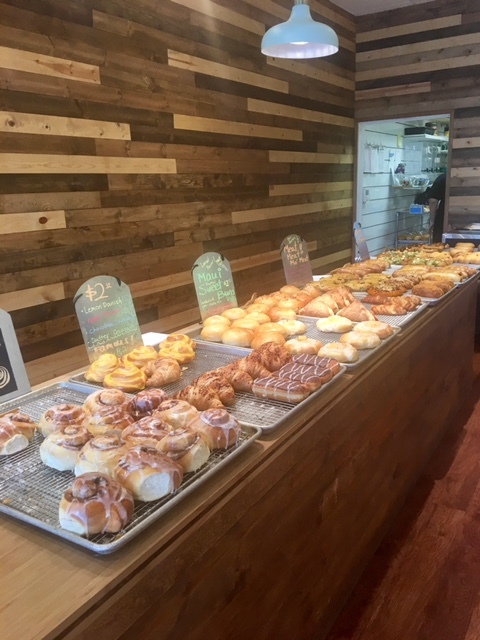 I just found out we have a new bakery in Kihei! Actually, not so new anymore. The owners of the Fish n Chips place in Dolphin Plaza (across from Kamaole 1 park) opened the Maui Bread Company 4 1/2 months ago. With my love of bread and baked goods, I am surprised that my nose hadn’t sniffed this place out yet. Everything is baked in house and from scratch. In fact, this morning when I went into the store, the two bakers were working the retail end of the store. They can tell you exactly what’s in everything. What do they sell? Besides the really good stuff (okay, cinnamon buns and danishes), they also sell cookies and a variety of breads. They also have a selection of gluten-free items. Their only advertising is done by word-of-mouth. The prices are reasonable compared to the grocery stores. I picked up a nice loaf of sourdough bread for my hunny (his favorite) for $5. The cinnamon bun I got for myself didn’t make it home. It was really good. Where to find Maui Bread Company? 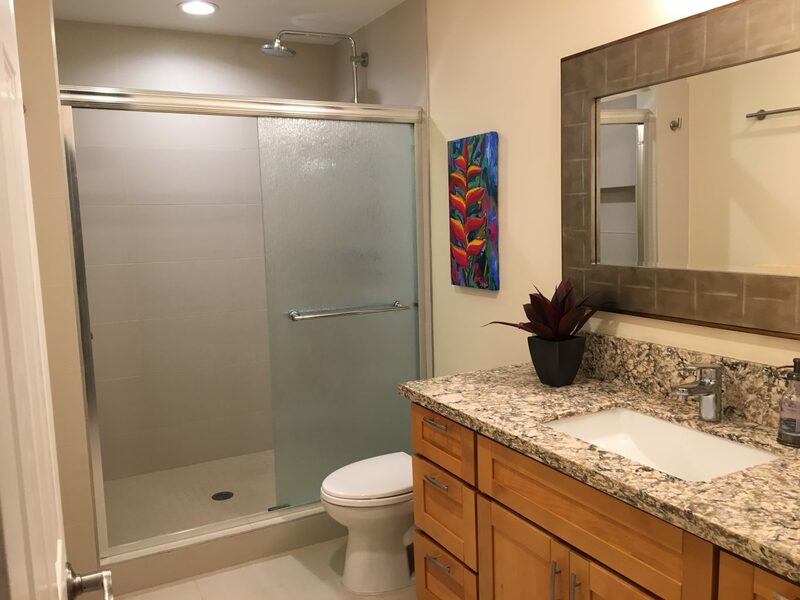 It is located in the Dolphin Plaza strip mall which is along South Kihei Road, across from Kamaole 1 beach park. This is close to Honolua Surf Company, Hawaiian Moons, Cafe o Lei and the ABC store. 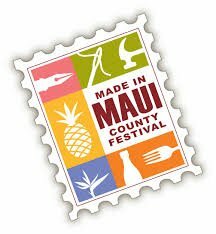 This past weekend the Maui Chamber of Commerce hosted its 3rd Made in Maui County Festival. 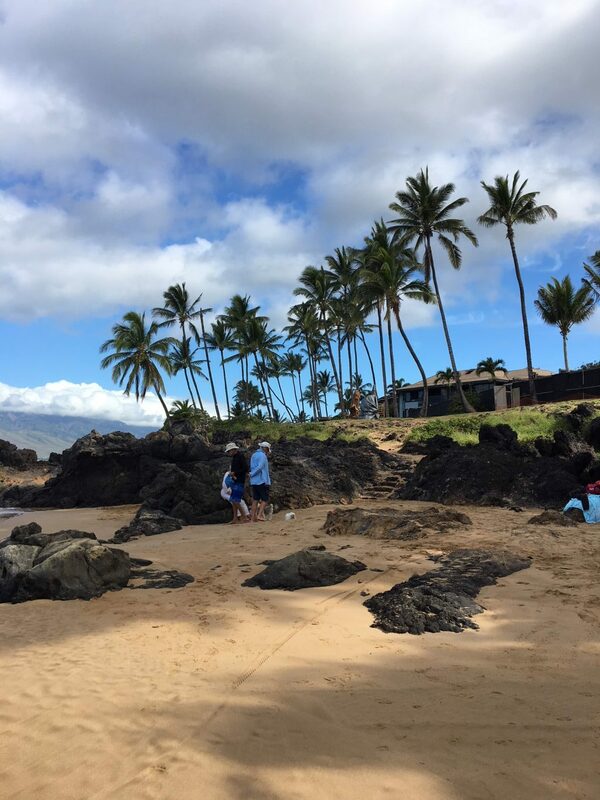 This was my second time going and let’s just say – it’s the perfect place to make Maui-made discoveries. Picture a craft fair – without any of the made-in-China-or-elsewhere items. A REAL craft fair, the way they are supposed to be! It was awesome! This year there were more than 140 vendor booths featuring their products. The rule is that everything shown there had to be 51% or more value added in Maui County. That includes Molokai (they had ten booths or so) and Lanai (1 vendor). Finds included handmade cards, jewelry, hot sauce, coffee, clothing vendors, artists, a plant stand, alcohol, food, etc. etc. My favorite discoveries this year? For the past few years I have been buying Alohi Images cards whenever I can find them. They are beautiful photographs of native plants and flowers. The problem is, these cards are hard to find. Imagine my surprise when it turns out I actually know the owner/photographer! Yes, I stocked up on Christmas cards. And, now I know that I can find her anytime! As for you, check out her website. Shelley tells me that her cards are now being sold at 5 Hallmark stores in the Hawaiian Islands. I had read about these in the Maui New last spring. 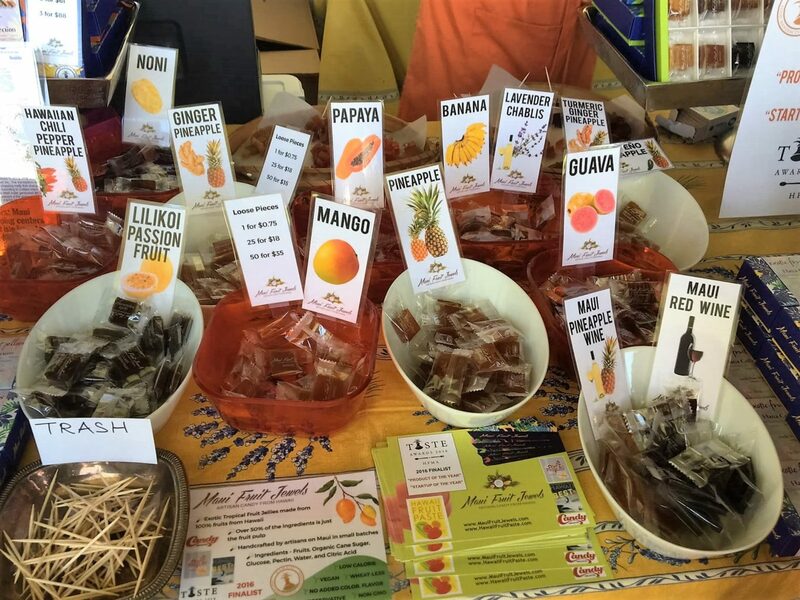 Gourmet fruit gummies for adults – okay, so they are okay for kids too, but not shaped like gummy bears. They have all local flavors – lilikoi, papaya, pineapple pepper (that one has a little bit of kick), Maui Wine (think wine jelly)… I forgot to ask where you can get them locally, so let me know if you find them (check out their online shop). Did you miss this year’s festival? 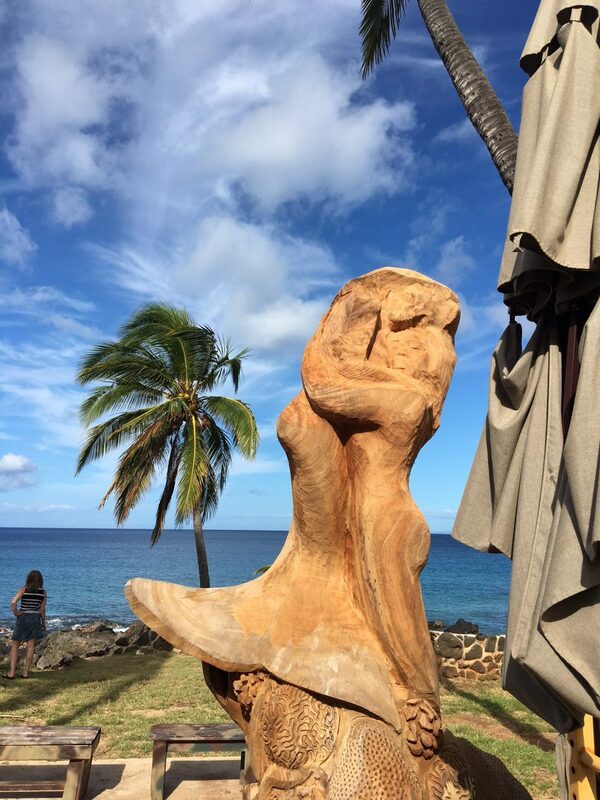 Looking for more Maui-made discoveries? Many of these vendors are featured on the Made in Maui County Marketplace, a website connecting you to the different vendors. Check them out! Mahalo for supporting local small businesses. This morning we checked out the Hali’imaile Distilling Company in Hali’imaile, upcountry Maui. They are the makers of several great products – Pau Vodka, Sammy’s Beach Bar Rum, Paniolo Whiskey and Maui Moon (flavored) Vodka. When driving up Haleakala Hwy, this is the first town on the left hand side, also famous for the Hali’imaile General Store (a Bev Gannon restaurant). Some of these oak barrels are filled with their Paniolo Whiskey, some with just water to keep the oak barrels in good shape. 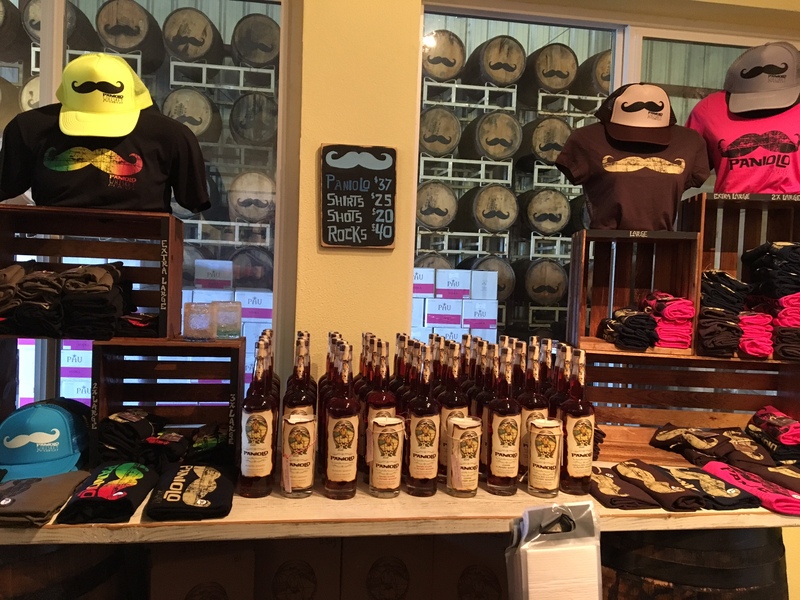 The mustache is the whiskey’s logo. Hali’imaile Distilling Company is set right between Maui sugar cane fields and 1300 acres of Maui Gold pineapple fields. Unfortunately the pineapple fields are somewhat hidden – further behind the Hali’imaile General Store (across the road and back a ways). We booked the tour online, showed up at our time and paid the entry fee of $10/person (which includes three samples at a tasting). The distillery tour was about 30 minutes long, the tour guide enthusiastic. This is a small-kine operation. They were just in the process of bottling some Pau Vodka on a small-scale bottling line. But hey – small batches are often best! The Vodka is made from Maui-grown sugar infused with additional molasses. The rum is made from Maui Gold pineapples (grown in Hali’imaile, and juiced for them by the Ulupalakua winery). At the end of the short tour we had fun checking out the merchandise and sampling our favorite product. It was still morning – but it’s 5 o’clock somewhere, right? Which was my favorite? I bought a bottle of cognac infused Pau Vodka. Yum. Another fun Maui artist – Beth Cooper! Have you ever bumped into someone you know in a completely different setting? I tend to compartmentalize my friends and acquaintances – then I when see them in a different place, it honestly confuses me, often I don’t recognize them…. how embarrassing! (If I’ve done this to you, I am so sorry). Beth Cooper with my new acrylic painting of Kamaole III beach park! This afternoon we were browsing the Lahaina Art Society Fine Art Fair under the Banyan tree, when all of a sudden – boom! 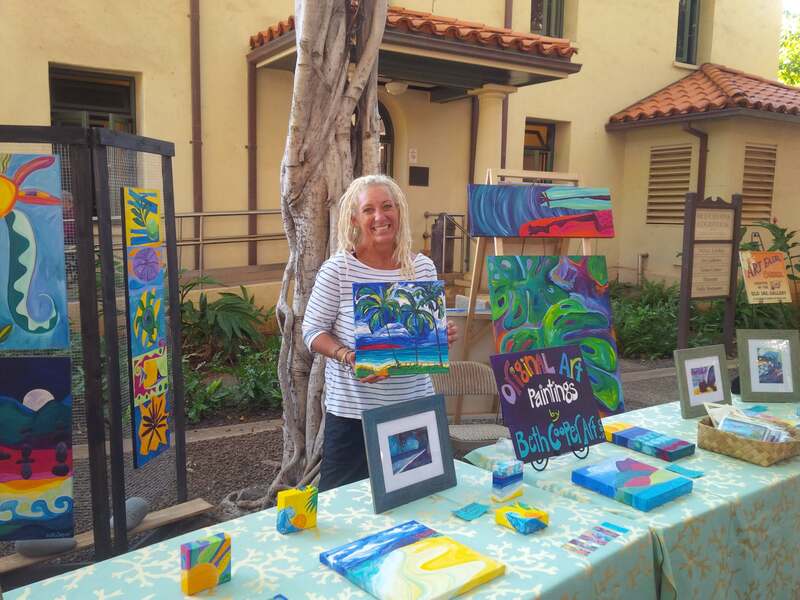 There was someone from the ‘condo compartment’ of my brain selling her beautiful paintings in front of the Old Lahaina Courthouse under the Banyan tree. Fortunately my brain made the connection and I recognized her – Beth! We checked out Beth Cooper‘s table and I bought a beautiful acrylic painting of Kamaole III beach park with Kaho’olawe in the background. I love it! I have just the spot picked out for it in one of the condos…. but…. we’ll see, it may stay at our house. Beth is a local artist (and outrigger canoe paddler/surfer/art teacher) and specializes in oil paintings. There is something for every budget – from originals to prints to note cards to shower curtains (!!). Check out her website! The Lahaina Arts Society is an organization that showcases and trains local (Maui) artists. They have two galleries in the Old Lahaina Courthouse, and several times of month host Fine Art Fairs (featuring their artists) under the Banyan Tree! The next fair is Sunday Dec 27th – yes, Beth will be there!